For those who like meeting more frequently like we do the in the summer at Wassamki Springs, we've continued the tradition by getting together at the Dunkin Donuts on Rt. 22 from 7PM-9PM on the "off" Thursdays. One of the of the most useful websites I've come across, especially for identifying and locating various digital activity, is HamSpots.net. The website, designed and maintained by Laurie Cowcher of Chirnside Park, Victoria, in Australia, is a valuable resource for monitoring digital clubs, scheduling QSO's, and tracking down activity on new or rarely used digital modes. 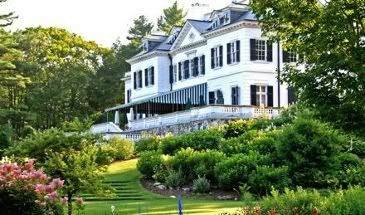 New England is rich in history and culture, from its architecture to its role in America's founding, and it’s also the birthplace and home of many great artists and writers. In this issue, we'll take a closer look at some of the homes and hometowns of authors who were born or settled in New England. 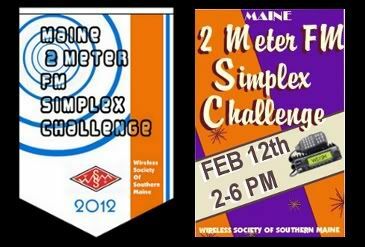 The 2nd Annual Maine 2 Meter FM Simplex Challenge will take place in just a few weeks! This is a fun contest to take part in, and there's categories for mobile as well as low power stations, so you don't have to invest in a new amplifier to be competitive. Last year saw more than a hundred participants, and the winning operator contacted only one more town than second place. 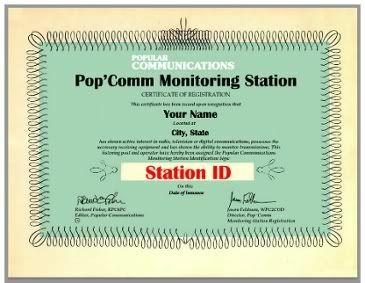 Popular Communications magazine announced that it will reintroduce its monitoring station certificate program in 2012. For those hams who got their start as shortwave listeners, this might be of interest. The program is well thought out, and allows SWL'ers to choose their own station ID suffixes (on a first-come-first-serve basis). For step-by-step instructions on how to receive your certificate, click here. "The Internet Archive project has just published nearly every issue of defunct 73 Magazine, all the way back to January 1961. While dominated by the editorial adventures of Wayne Green W2NSD, the magazine also features loads of simple construction articles, expedition adventure writing by Gus Browning W4BPD and others." 73 Magazine enjoyed a loyal following throughout its run, and its back issues should be a lot of fun to revisit. The Internet Archive Project's collection of 73 Magazine is available here. February 9th - from 7PM-9PM at the Gorham Recreation Department. March 8th - from 7PM-9PM at the Gorham Recreation Department. The Wireless Society of Southern Maine would like to welcome Roger Pience, N1XP of South Portland, as our newest member. Rumor has it that one of our club members has changed his call to KA1QW, and that he's worked 50 countries so far on JT-65! 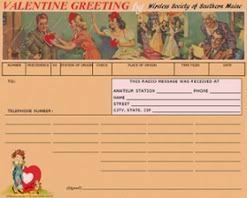 Send a Valentine by Radiogram! Want to send a greeting to that special YL or XYL in your life, but don't how to say it? Send her a radiogram! The Wireless Society of Southern Maine is pleased to offer this specially designed greeting. All you have to do is relay a message by radio to WS1SM, or send an email to [email protected] which includes the name, address, and telephone number of the party you are sending it to, along with any special handling instructions, and a message of 25 words or less - and we'll take care of the rest. First, I'd like to start out by wishing all of our readers a Happy New Year! By now you've probably noticed the Radiogram's new look, which is more streamlined than the original, and offers more complete stories and pictures right on the first page. 2012 is already off to a great start. Many of us enjoy getting together on the off Thursdays at the Dunkin Donuts on Rt. 22, where we sometimes talk a little radio, but usually about anything else that comes to mind. In January, we look forward to Roger Pience's (N1XP), presentation on "soldering" during our monthly meeting, and in early February, we'll be hosting the 2nd annual Maine 2 Meter FM Simplex Challenge, which is already getting a lot of press on the forums, and is even mentioned on ARRL Section pages as far away as Western Massachusetts and Vermont! Good luck to all who participate! Remember, if anyone is interested in contributing, just send along a story, idea, brag, or picture to [email protected] I also welcome any comments or suggestions on how to improve The Radiogram for future issues.